This pass connects the top of the col Ste Roch with the Gorge of the Vesubie. Especially approaching Col de Porte from from Luceram (with Col Ste Roch as shoulder point) there is an amazing transition between dry badlands topography to rain forest like vegetation in the gorge. This is one of those wonderful "extended Nice area" roads, that seems to hardly have any traffic. Looking for this crossing on a map, there is also a nearby Col de la Porte to the north of the Col de Porte. The former is only accessible by trail. From West. From one view point Luceram is probably the most interesting point of this excursion, even if it is just at the beginning, of where the approach to this pass is often said to start. In order to maximize the elevation gain the profile above starts quite a bit lower. Signs in Luceram mention 4 passes: Col de Porte, Col de l'Able, Col de l'Orme, and Col de Turini. But only Turini gets the major league treatment from the road signage. Periodically placed signs show the remaining climbing elevation, distance, and current average slope. The road up to the shoulder point Col St Roch climbs into dry topography, directly across from Luceram. The lower switchbacks are a great vantage point on the town, from which the two distinctive church towers can be seen. The most extensive series of switchbacks along the route are near the top of Col Ste Roch. Past that the road to Col de Porte becomes even less formal, just a wavy remnant of tarmac between rough wooden guard rails, and climbs to the top between dry forested hills. Unfortunately lots of small electricity towers make photography of the pass difficult, unless the poles themselves become the subject of the picture. From East. (described downwards) The long curvy descent takes a break before reaching the hilltop village of Loda. Here the road climbs a little before descending on a shelf into the Gorge of Vesubie. I was surprised several times by meeting mountain sheep at stream bridges during the descent. Descending further down the Vesubie Gorge the traffic is now much heavier. 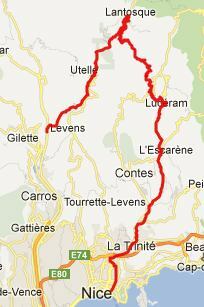 Col de la Porte , D19 Levens(sh) , Col de Quatre Chemins: 177 bd observotoire, Nice > col de Quatre Chemins <> out and back to end of route strateqique from top >> Cantaron > D21 > l'Escarene > Luceram > Col de Ste Roche(shp) > col de la Porte > Loda > D19 south > D19 Levens(sh) > Nice > sp: 69.2miles with 6720ft of climbing in 6:20hours (VDO MC1.0 m4:12.5.13).